When Topeka drivers need an oil change, they rely on the team of auto repair technicians at Doug’s Service Center. An oil change may sound like a simple service, but our auto mechanics will tell you that it is not to be forgotten. To keep your vehicle running in tip-top shape, an oil change is an absolute must, and our team at Doug’s Service Center will make sure you don’t forget about this imperative service. At Doug’s Service Center in Topeka, we sincerely care about our customers. We look out for you, your family, and your vehicle, whether you are coming for an oil change or brake repair. The safety, reliability, and driveability of your car are our top priorities. Our team will perform a quick and accurate oil change while getting to know both you and your vehicle. We aren’t just looking to have you in and out and on your way. We want to understand you and your family and form a lasting relationship destined to keep you and your vehicle driving down the streets of Topeka for many more months and miles to come. So why not come in for that oil change? 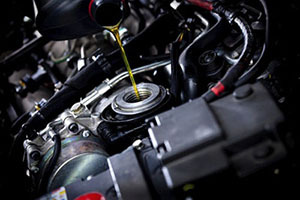 The next time your vehicle needs an oil change, turn to the auto repair technicians at Doug’s Service Center in Topeka. Determined would be a good word to describe our team, as we won’t quit until your vehicle is running in pristine condition. Schedule an appointment today, or stop by at 601 Southwest Fairlawn Road, Topeka, KS 66606.